Compiled under direction of the Roster Commission, Published by Authority of the General Assembly (Ohio), printed by The Ohio Valley Press, 1889. This is an original 1889 printed edition. Covers show wear. Inside pages are very nice and clean. A few pages have an occasional small pen mark. 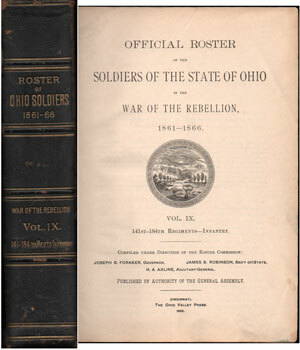 A lengthy and detailed list of thousands of Ohio soldiers who served during the Civil War in the 141st to 184th Regiments of the Army. Gives the name of each soldier in the regiment, rank, age, date of entering service, period of service, death date or the date mustered out of service. Also includes a brief record of the service of each regiment. Hard cover, 790 pages. A rarely available volume. The book described above is priced at $99.95 plus $1.95 shipping. If you wish to pay by credit card, please use the shopping cart below (checkout goes to a secure server.) Credit card orders may also be placed by phone to Hearthstone Legacy Publications from 9 AM to 11 PM (Central Time Zone) Monday thru Saturday at 816-204-7593.